Happy Friday, my Cutting Edge Stencils friends. Today we have a craft project that is super easy and tons of fun to complete. We bet after reading this post you’ll be hooked on our painted accent pillows! 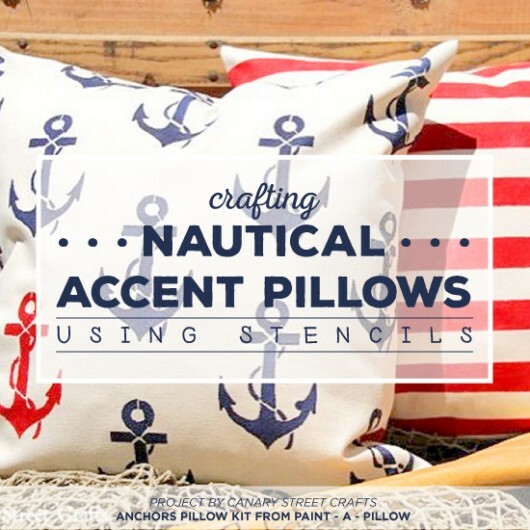 Let’s take a look at a nautical Paint-A-Pillow project. We’d like to introduce Amy, the creative DIYer behind the blog Canary Street Crafts. Amy is in the process of giving her son’s bedroom a nautical makeover with one DIY project at a time. 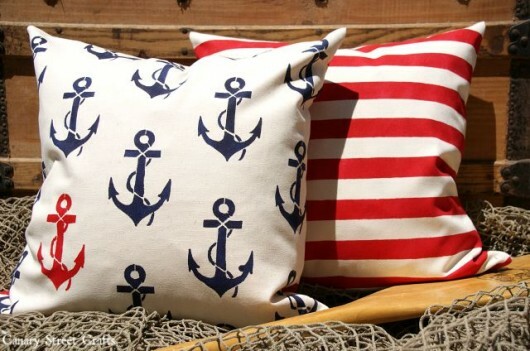 So when we introduced her to Paint-A-Pillow, she jumped at the chance to create some nautical accent pillows for his bedroom. 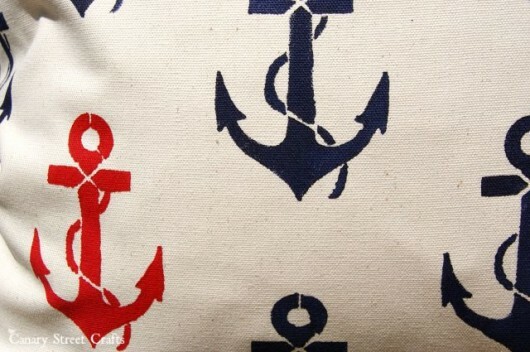 Amy ordered the Anchors Away Paint-A-Pillow kit, a natural pillow cover, and Jacquard Fabric Paint in navy blue and ruby red. Amy was excited when her Paint-A-Pillow kit was delivered. 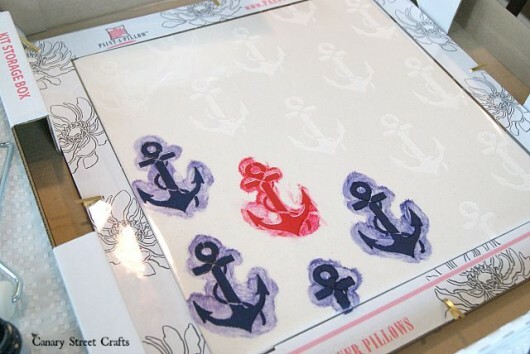 With her Anchors Away Paint-A-Pillow kit in hand, she read through the simple instructions that were included and was ready to start her project. Amy chose to paint the majority of the nautical design in navy blue and one anchor on the lower left hand corner in ruby red. First she painted the red anchor using a stencil brush and then she painted the navy blue using the dense foam roller. ** If you’re recreating this at home, be careful not to overload the brush and roller with too much paint. Brush or Roll off the excess paint onto a folded paper towel until it looks almost dry. The key to stenciling is using as little paint as possible. Too much paint will cause the design to bleed and smudge. Once the entire pillow cover was painted, she peeled back the metal tabs holding the stencil in place to reveal her painted pillow. Then she painted the opposite side. 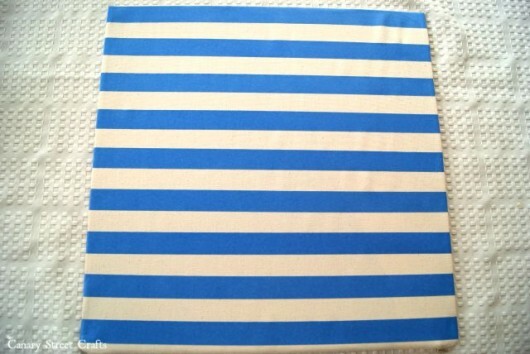 For the other side, Amy chose to paint stripes using painter’s tape. She used the same dense foam roller and the Jacquard Fabric Paint in ruby red. When the painted pillows were dry, Amy stuffed the insert into the cover. Presto chango, her painted accent pillows were complete! Amy had this to say about her stencil project, “Pretty cute, huh?” Totally! 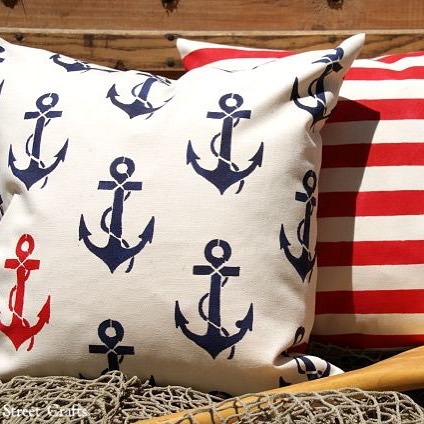 We love the color combination paired with this nautical pattern. 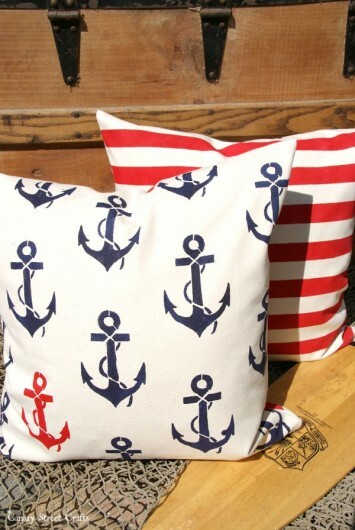 Tell us: Do you like to decorate with Nautical decor like these Anchor stenciled accent pillow? Leave us a comment below! Looking for more Paint-A-Pillow fun? Shop our Paint-A-Pillow kits and find the perfect design for your home! Have you completed a pillow project? Come share it on Facebook!